“Madame Pique” had a dancing academy at the northwest corner of Kearny and Post Streets, in San Francisco; “Mr. Galavotti” was her assistant. In later years, Galavotti — born Theodore Lazare Galavotti, in Bologna, Italy, about 1805 — had his own academy and was known as Professor Galavotti. He died in San Francisco on 6 May 1880. Of immediate interest is the venue. The “large musical hall” is the same Musical Hall — at the southeast corner of Montgomery and Bush Streets — that Emperor Norton referenced five years later, in his original Proclamation of 17 September 1859, published in the San Francisco Daily Evening Bulletin newspaper. I…do hereby order and direct the representatives of the different States of the Union to assemble in Musical Hall, of this city, on the 1st day of February next, then and there to make such alterations in the existing laws of the Union as may ameliorate the evils under which the country is laboring, and thereby cause confidence to exist, both at home and abroad, in our stability and integrity. Musical Hall was built in 1853 by Harry Meiggs. In fact, it was Meiggs whose commission of Madame Pique’s husband, Edward — a composer and instrumentalist — had brought the couple to San Francisco in July 1852. No doubt, it was this relationship that opened up the opportunity for Madame Pique to host soirées at Meiggs’s hall. Alas, the hall was destroyed on 23 January 1860, just a week before the appointed date, in a fire — “the work of an incendiary,” i.e., an arsonist, according to the Alta — that started in the nearby Albion boarding house. The Emperor quickly rescheduled his convention, issuing a Proclamation on January 28th that was published in that evening’s Bulletin. A few days later, upon realizing that the 5th fell on a Sunday, he adjusted the date a second time, to Wednesday 8 February. We’ll return to Assembly Hall shortly. But, first: Who was Madame Pique? A couple of years earlier, in 1890, the Morning Call newspaper published a brief profile of Edward Pique noting that Madame Pique had a first name: Frances. It’s not clear how much — or whether at all — Edward was involved in dance instruction in the Pique’s early years in San Francisco. It appears that he was known primarily as a composer. Dance — that, and the production and hosting of elaborate soirées — was Madame Pique’s wheelhouse. The owner of the hall was W.H. Whitmore, according to the Alta. 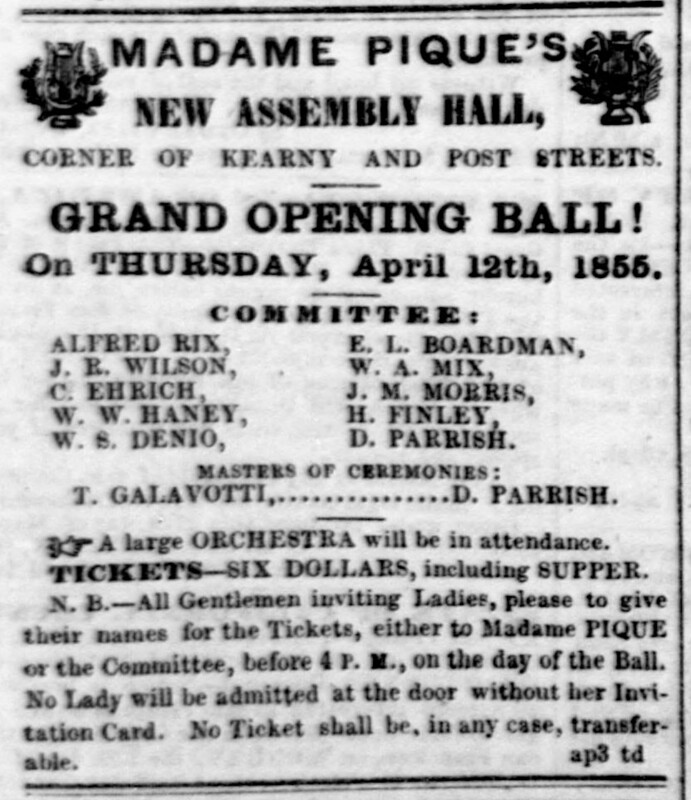 But — as was heralded by this early April 1855 ad for the “Grand Opening Ball” — Madame Pique was the brand. Whether the Piques had a financial stake in the new building or paid a branding fee for the name is unclear. George Horatio Derby’s humorous sketch, “Butterfield at the Ball” — originally published in the San Francisco Herald newspaper (which Derby had recently purchased) on 31 December 1855 — gives an idea of the cachet and the clientele of Madame Pique’s soirées. The hall quickly became known as Madame Pique’s Assembly Hall — or Madame Pique’s Hall — or even just Madame Pique’s. The second of these names is the one used in the following excerpt of an account of events surrounding the Second Committee of Vigilance — a conflict that lasted from 14 May until 11 August 1856. A “Law and Order Party” was established to resist the Committee. This “Party” had a number of armories — including one at Madame Pique’s Hall. In late June 1856, the Committee confiscated all the Law and Order weapons at Madame Pique’s. It’s unclear whether the owner of the hall — or, indeed, the Piques themselves — were sympathetic to the Law and Order Party, or if the hall was forcibly commandeered. Toward the end of 1858, Madame Pique remains ensconced at the corner of Kearny and Post; but, the new title of the place — “Assembly Hall” — is digging a groove. The following editorial item suggests that, in May 1859 — just 4 months before Emperor Norton’s original Proclamation in September 1859 and just 9 months before the Emperor’s updated order instructing delegates to gather at Assembly Hall in February 1860 — Madame Pique still was presiding. The reference to “Madame Pique’s Assembly Hall” is a throwback, as it had been a couple of years since the hall advertised itself as such. In May 1860, the Alta ran the following ad making it pretty clear that Madame Pique had moved on — at least from the northwest corner of Kearny and Post. 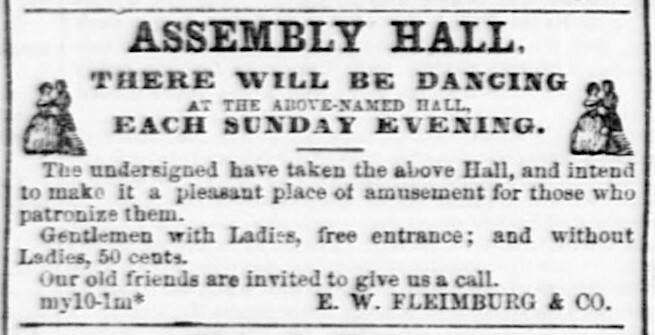 In the ad, E.H. Fleimburg & Co. — a misprint; the name was Heimburg — announced that they had "taken” the hall. Was Madame Pique still at her Assembly Hall when Emperor Norton in February 1860 — three months earlier — gave notice that this was to be the venue for his “National Convention”? The fact that the Emperor specified a location and a date for the convention — but never a time — suggests either that he didn’t believe it would happen — it didn’t — or that he hoped others would take up his cause and take care of logistics. Did Emperor Norton know Madame Pique? Did he approach her — or her husband — for assistance in making Assembly Hall available for the ceremonial launch of his Empire? Add these to the mysteries! Although Heimburg & Co. made an initial effort to continue Assembly Hall’s “soirée tradition,” Heimburg and subsequent owners pivoted away from the hall’s earlier arts-and-entertainment “program” and turned Assembly Hall into what we would recognize as a conventional event space. For much of the 1860s, Assembly Hall was an “empty vessel” rented out for a variety of uses — social and philanthropic club events; trade and industry association meetings; religious services, the occasional lecture. An item in the Alta of 12 September 1867 reported that Assembly Hall had been “taken” by the Temperance Legion of San Francisco. The Temperance Legion used the building for the next couple of years and even tried to brand it as “Temperance Legion Hall.” But, the listing of “Halls” in Langley’s San Francisco directory of 1869 — published in December of that year — makes clear that the building continued to be known as Assembly Hall. It doesn’t appear that the local papers took note of any demolition of Assembly Hall. But, on 5 December 1870, the Alta ran a story about a new building nearing completion on the former site of the hall: a dry-goods emporium known as The White House. Over the next four-and-a-half years, the Appeal would publish some 250 Proclamations by the Emperor. He was about to bloom. It appears that this venture was short-lived and that Madame Pique “retired from public life,” remaining known and respected mostly as the wife, then the widow, of Professor Pique. In late 1879, the Pique’s adopted daughter, Frances — who was in the process of applying for certification as a public school teacher — was caught up in a scandal involving a “mysterious man from Sacramento” who was providing applicants with answers to certification exam questions in advance. I do not know the man. He came last Sunday evening about half-past seven. I think he must have watched the house until my husband left, which he does early every Sabbath evening to attend to his duties in the choir at St. Joseph’s Church. He had been gone but a few minutes, and myself and daughter were at the front door, just starting for church, when the door bell rang. I opened the door and a man stepped in and said, “Madame Pique"?” Everybody calls me Madame Pique. I told him that was my name. When Madame Pique died at 90 on 9 January 1901 — the day after the 11th anniversary of Emperor Norton’s death om 8 January 1880 — there were brief notices in all three of the city’s major papers: the Chronicle, the Examiner and the Call. Notices, but no title. She was listed simply as Frances Pique. No doubt, the Professor called her Frances. Pins for Assembly Hall and Musical Hall have been added to The Emperor’s Bridge Campaign’s interactive Emperor Norton Map of the World. The map now includes 57 sites where the Emperor lived, worked or frequented — or that otherwise are associated with him. Also included are 14 works of Emperor-inspired public art spread across 11 locations.